It's a travel day for me, so neither Twitter updates nor blog posts on Stage 8 until this evening. I know some of you will remember I'm involved with Bike Hugger, a Hugger Industries site that tries to embrace all things bicycle, including bike commuting, bike travel, bike culture, and even racing. But in keeping with the all-inclusive nature of the site, we wanted to get involved with citizen racing, people who race for the love of it, and arrange their lives to support their racing habits. So we hooked up with some very dedicated women in the Pacific Northwest, who just competed at the Redlands Classic, and who are blogging about their season over at Team.Bikehugger.com. If you've ever considered racing yourself, check it out. TdFblog is hosted on TypePad, the hosted MovableType service from Six Apart. Yesterday, they had a serious outage, and lost post data for midnight to 10:30 a.m. Pacific Time, or pretty much everything Byron and I posted yesterday. Fortunately, a little voice in my head told me to grab those posts into my off-line editor, MarsEdit, yesterday morning, so I've been able to repost them. Unfortunately, for now at least, they're showing up with the current date, and TypePad errors out when I try to reset the dates. Also, it appears that comments made yesterday morning were also lost, for which I apologize. At one point, TypePad would e-mail me all new comments, but that hasn't worked for a while, so I don't have any record of those comments. Again, my apologies. Thanks for the invite Frank and I'm glad I can help out as a guest blogger. Couple notes for the readers. I'm in Seattle, on PDT, so the live blogging will be a bit delayed. When I turned on OLN today, AG2R got the win! I'll recap the rest of the stage here in a bit and please remember that comments still need to approved by Frank and that'll take a few days. Please continue to send them in. Also, as Frank noted in his intro post, we're working together on Bike Hugger and there's lots going on there, including bike culture, STP, and other cycling events (besides the tour). Frank will get caught up on posting there when he gets back as well. I've got to go out of town for a couple of days for an out-of-town funeral. I've arranged for DL Byron, designer, blogger, author, entrepeneur, and amateur racer, to fill in for a couple of days. Byron was one of the first advertisers on the site, with his company Clip-n-Seal, which makes awesome clips to keep things fresh in regular bags, and he and I are working together on Bike Hugger, a new blog covering bike culture. Comments may be held a little longer than usual for moderation for the next couple of days. I wanted to offer a quick shout-out to two new sponsors. 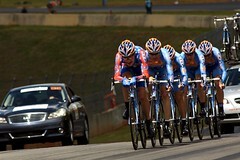 RoadCycling.com has become an annual sponsor, during each year's Tour. They offer a diary from Julian Dean, so we should see some interesting commentary on today's late-stage wipeout over there. RoadCycling's RSS feed is here. Bike Hugger, on the other hand, is a new venture I'm working on with DL Byron of Textura Design. It's about bike advocacy, utility cycling, commuting, day touring, bikes as art; whatever will turn the cranks of people who love bikes. You can follow the Hugger in your newsreaders by subscribing to its RSS feed. A couple of site-related tidbits: DL Byron's new book, Publish and Prosper: Blogging for Your Business, is now available from Amazon.com and geekier bookstores everywhere. It's a guide to building a blog that supports your business goals. Byron and Steve Broback have a great track record helping Boeing find a voice in the blogosphere, and their book concentrates on how to get started — finding a niche, a platform, and a voice you can call your own. TdFblog is one of dozens of example weblogs in the book. Here's the book's website, where you can check out a sample chapter. Also, you shouldn't see any differences, but I've moved the site's syndication feeds over to FeedBurner. TypePad now offers easy integration with FB, and I can finally get some idea of how much of my traffic comes through RSS and Atom. Please let me know if anything's gone squirrely. So, with the Tour de Georgia rushing toward us, I found myself finding links that I'm interested in because of the TdG, but that I'm not really sure are appropriate to TdFblog. A quick domain-name check found that nobody was holding TdGblog.com, so, as of today, TdFblog has a new, close sibling. The initial contents of the new site are all the articles in this site's Tour de Georgia category, but moving forward, I expect no more than about 20-25 percent overlap. Today, for instance, I've posted stories about the 2006 Tour de Georgia's TV coverage and what Litespeed is doing at the 2006 TdG, both exclusively on the new site. Look for race previews and reports on both sites. Each site will offer a feed of the other's recent headlines, and of course, they'll have separate syndication feeds. Here are TdGblog.com's feeds in RSS, RSS 2.0, and Atom formats. DL Byron, one of the co-founders of the Blog Business Summit, has used this site as an example at the Summit. Now, he and his co-organizers are wrapping up a book for Peachpit Press laying out what they've learned building blogs with and for Boeing, Clip-n-Seal, and Connexion, and from hosting their conferences. If you're looking for more hands-on advice on starting and running a business blog, there's a pre-publication deal where you can get the book for 35% off with free shipping by ordering through the web and using the promotion code: PP-234P-LKMS. I usually roll the site over right on January 1st, but I've had a lot going on, and am, like the pro teams, just kicking off my preseason training. Expect posting to return almost to normal. If you think the Tour is hard on participants, you should see what it does to bloggers! I'm spending the week recuperating in southwest Florida, which could be paradise if only it had widespread broadband connectivity. Barring that, posting will likely be light this week. Thanks for all the compliments for the site's Tour coverage. I'll be back next week, with news about Tour riders prepping for the Olympics, and all the post-Tour hoopla. Welcome to the site's new sponsor, Clip-n-Seal, a simple but innovative way to close and reseal all kinds of bags. Clip-n-Seal's rod and clamp system locks in freshness, and locks out air and water. Check out the Fish-in-a-Bag video demo for proof (Note: no fish were harmed in the making of this video!). Just $4.99 American gets you 3 large Clip-n-Seals (sized for large chip bags, pet food, or popcorn) or a variety pack of small, medium, and large. Joe Bob says: "Clip-n-Seal is like a recloseable bag, but without the bag." In advance of the Tour de France prologue on Saturday, I've made a few changes to the site. Some of them have filtered into production over the last few days, and I'll probably continue to tweak things over the next couple of days. The most obvious change is probably the "Top Stories" heading. I got frustrated last year by the limitations of the weblog format, when a major story would break, but then get scrolled way down the front page by smaller, more recent stories, and disappear. The "Top Stories" section is my first crack at addressing that; I may make some more changes to it. A couple of recent additions are the search engine link at right, which lets you search the site or the entire web through the magic of Google, and the "Tour posts at other weblogs" section down the right sidebar, which will highlight other webloggers and (again through the magic of Google) Usenet posters commenting on the Tour. The 'Recent Posts' section no longer duplicates front-page stories. Once a story rolls off the front page, it will move to the 'Recent Posts' section, then move into the Archives. If you're on a daily, monthly, or category archive page, you'll also get a sidebar listing the current contents of the front page. The 2003 Tour Wayback Machine has been retired to a quiet home on the Archives page, along with most of the rider category links. In their place is a dynamic list of the most recent posts about top riders, and I'll be adding riders to the list as the Tour progresses. The Wayback Machine will return, offering a simple way to jump back to any stage of the 2004 Tour. And, as always, the calendar at right is clickable, and will take you back to posts from that date. I hope you'll enjoy the changes. If anything looks strange, or you have any comments on the changes, please post them as comments on this post. I’ve had enough visitors here on TDF2004 that I decided to buy a new domain for the site. I’m sure I was partly inspired by the new domain mapping wizard from TypePad, which hosts this weblog. I think the one that meant the least typing for you, my readers, was “TdFBlog.com” (capitalization optional). You can still use the old http://notd.blogs.com/tdf/ form, or www.tdfblog.com. I made some design changes, as well, so if anything looks off, or doesn’t work, please e-mail me. At the same time, I enabled an Atom feed (What's Atom? ), and there’s still an RSS feed, as well (What’s RSS?). If you've followed the site, thanks! One of the reasons I started TdF 2003 was to try out the new hosted service from MovableType, called TypePad. If you're curious about weblogs, you may be interested in a fairly quick review I've posted over at my regular weblog. I'll be traveling today during the stage, and will post the usual gaggle of links this afternoon or early evening.